Attached is a Division Memorandum from Atty. Augustin P. Laban III, Assistant Schools Division Superintendent, Division of Baguio City dated November 10, 2015, entitled “SECURING PERMISSION TO TEACH AND PERMISSION TO STUDY” which is self-explanatory, for the information, guidance, and compliance of all concerned. 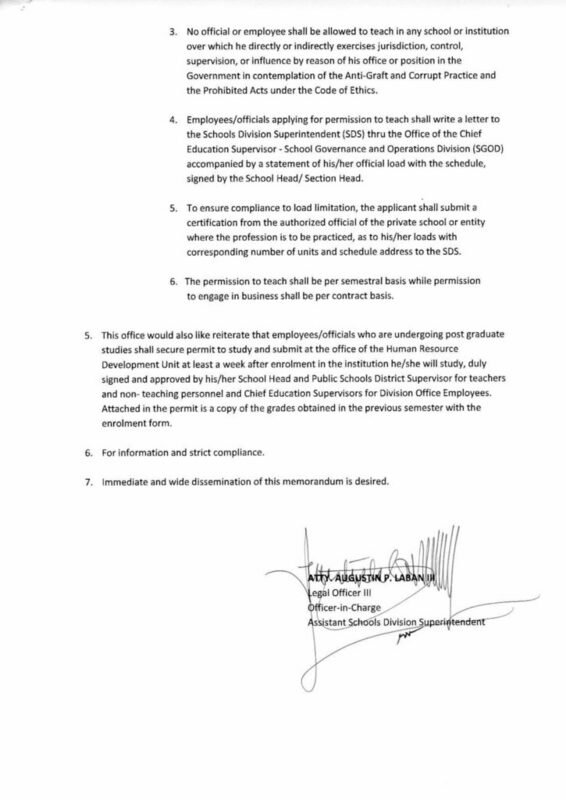 This is to reiterate a Civil Service Memorandum relative to private practice of profession or employment in private schools and other entities of all Division Office Employees, Teaching and Non-teaching personnel. However, DepEd Order No. 5, s. 2008 identified the approving authorities on requests for permission to teach, exercise of profession, or engage in business outside office hours. Permission to teach maybe granted only for subjects or courses which are related to the particular field of work of the official or employee concerned for special fields or subjects where there is dearth of qualified teachers. If permission to teach shall be granted, teaching load shall be limited to twelve (12) hours a week, and in no case shall a government officer or employee be allowed to teach more than three hours a day on regular working days. 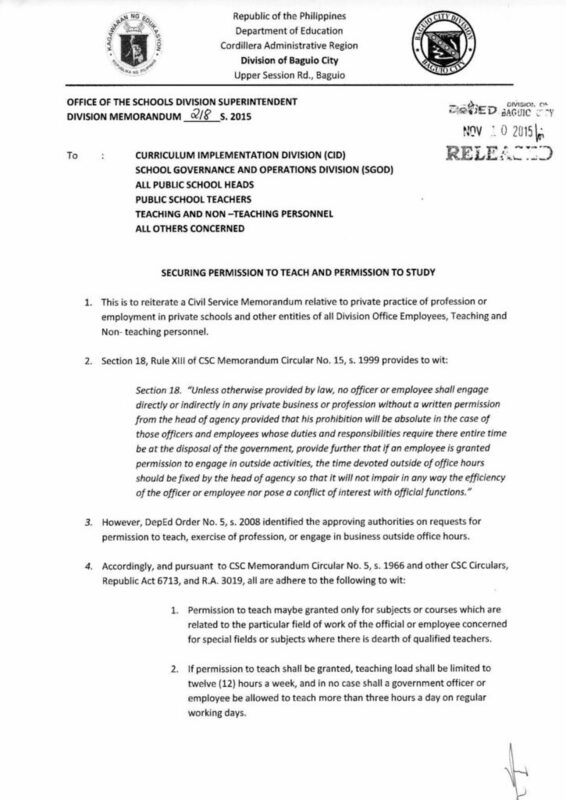 No official or employee shall be allowed to teach in any school or institution over which he directly or indirectly exercises jurisdiction, control, supervision, or influence by reason of his office or position in the Government in contemplation of the Anti-Graft and Corrupt Practice and the Prohibited Acts under the Code of Ethics. Employees/officials applying for permission to teach shall write a letter to the Schools Division Superintendent (SDS) thru the Office of the Chief Education Supervisor – School Governance and Operations Division (SGOD) accompanied by a statement of his/her official load with the schedule, signed by the School Head/Section Head. To ensure compliance to load limitation, the applicant shall submit a certification from the authorized official of the private school or entity where the profession is to be practiced, as to his/her loads with corresponding number of units and schedule address to the SDS. The permission to teach shall be per semestral basis while permission to engage in business shall be per contract basis. This office would also like reiterate that employees/officials who are undergoing post graduate studies shall secure permit to study and submit at the office of the Human Resource Development Unit at least a week after enrolment in the institution he/she will study, duly signed and approved by his/her School Head and Public Schools District Supervisor for teachers and non- teaching personnel and Chief Education Supervisors for Division Office Employees. Attached in the permit is a copy of the grades obtained in the previous semester with the enrolment form.